Get yourself along to Cavill Mall in Surfers Paradise Qld and see the Christmas lights light up the mall. While you are there, visit Santa with his surfboat sleigh, which is being pulled by six kangaroos. 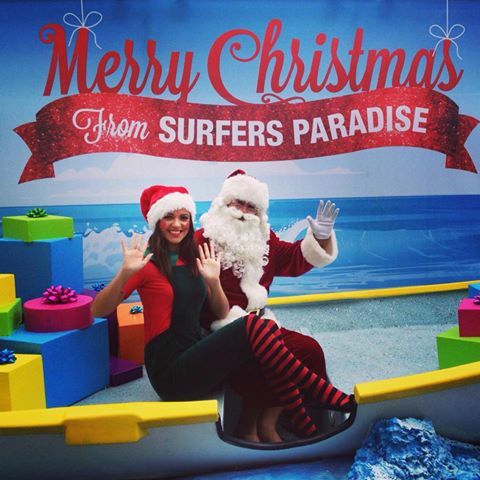 Come along to Surfers Paradise to see santa and get your picture taken. Photo courtesy of the Surfers Paradise Alliance. From Sunday the 13th of December to Thursday the 24th of December you can experience those warm balmy nights in Surfers Paradise with family and friends while taking in the spectacle of the Christmas lights, as well as everything else that will be going on in the mall. While there, you can take the opportunity to snap a free photo with the man in the red suit too. Santa and his Elf helper will be available for FREE family photos in the kangaroo sleigh daily between 12:00pm to 3:00pm, 4:00pm to 7:00pm. 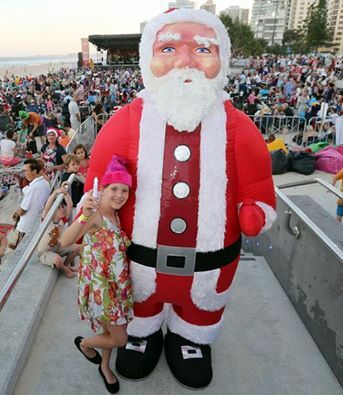 But please take note on Sunday 20 December, Santa will only be available for photos from 12:00pm to 3:00pm as he will be attending their special Carols on the Beach event! That's one big Santa. Photo courtesy of the Surfers Paradise Alliance. Cavill Mall and Cavill Avenue was named after Jim Cavill, who was the original hotelier who effectively gave birth to Surfers Paradise tourism. The Mall/Avenue is lined with shops, fast food outlets, nightclubs, bars and an array of restaurants. It's a place where you will see lots of surf art and regular live music performances from buskers lining the street at night. • Beachfront Markets are on every Wednesday, Friday and Sunday nights from 5pm to 10pm from September to April and is a great place to shop to find that unique gift for someone, maybe some fashion; or what about a piece of interesting jewellery, artwork, photographs or some hand-made beauty products. You will never know what you will find at the markets unless you go. 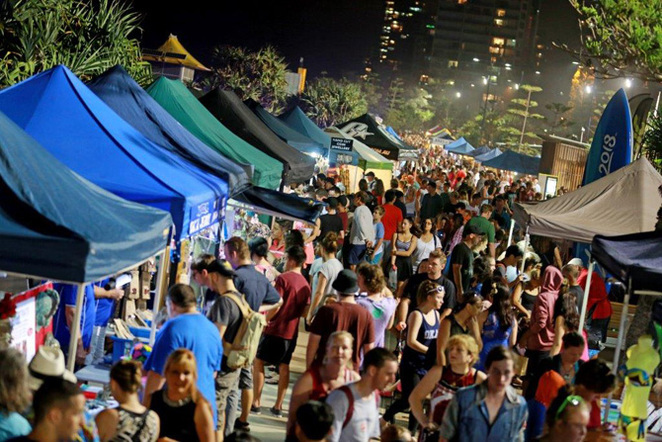 Don't forget to check out the markets in Cavill Mall. Photo courtesy of the Surfers Paradise Alliance. With around 100 stalls displaying their wares you are sure to find something that will take your fancy. It will be a great way to spend an evening with family and friends while taking in the Christmas lights. The markets are situated at the northern end of Cavill Mall/Avenue and for more information you can visit their dedicated Surfers Paradise Beachfront Markets Facebook Page for news and updates. 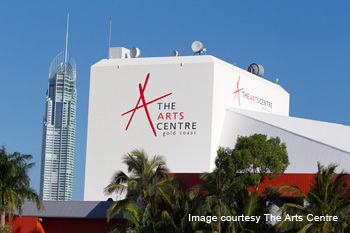 • The Arts Centre Gold Coast is the Gold Coast's premier cultural facility, bringing visual and performing arts to the residents of South East Queensland. The complex houses the Arts Theatre, Gold Coast City Gallery, two Cinemas and the Arts Cafe as well as several stunning function rooms, a chapel and two small performance spaces where depending on the night of the week you'll find live jazz or a stand up comedy club. Take the time to visit the Arts Centre Gold Coast. Photo courtesy of the Arts Centre Gold Coast. You could learn to surf on Surfers Paradise Beach, go to the Sporting Hall of fame at the Surfers Paradise RSL, visit the Wax Museum, take a shot at the Australian Shooting Academy, become a Co-Pilot on the Jet Flight Simulator, take the kids to King Tutt's Putt Putt or ride up in the elevator of the Q1 building to the 77 and 78 floors sit back, relax and grab a bite to eat from the licensed Seventy7 Cafe & Bar and enjoy the unsurpassed 360 degree views of the Gold Coast beaches to the hinterland and beyond. 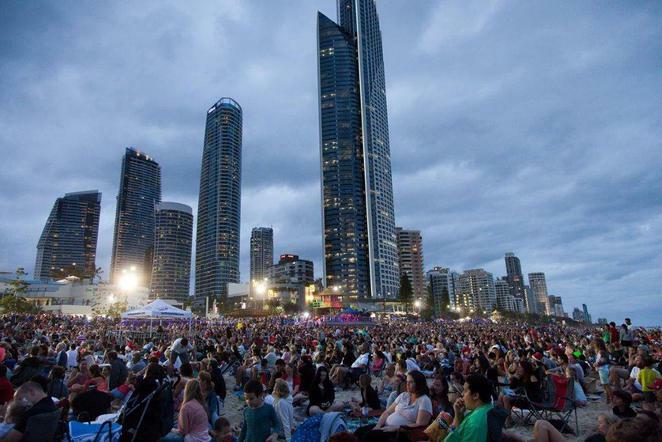 While you are up at Surfers Paradise you should also take the opportunity to take the family and a picnic blanket along to the 2015 Surfers Paradise Carols on the Beach on Sunday the 20th of December at 6.30pm and enjoy an evening of song with the whole family. Sing along to the carols at the Carols on the Beach at Surfers Paradise. Photo courtesy of the the Surfers Paradise Alliance. For more information on accommodation, arts & culture, attractions, beachfront markets, dinning & nightlife, health & beauty, services, shopping, spot & recreation, tours & sightseeing, the wider Gold Coast and special deals you can visit the Surfers Paradise Gold Coast website and check out their "Things to do page". Click here for more information. And while you are surfing the net, you should check out the Surfers Paradise Alliance Facebook page and see what else is coming up. So, if you are thinking of going on a summer holiday, why don't you pack up your family and or friends and head up to Surfers Paradise and take in the sights and sounds of Cavill Mall/Avenue Christmas lights and be sure to remember to bring your camera to snap a free photo with the man in red! Why? A great place to chill out and unwind while taking in the sights and lights.